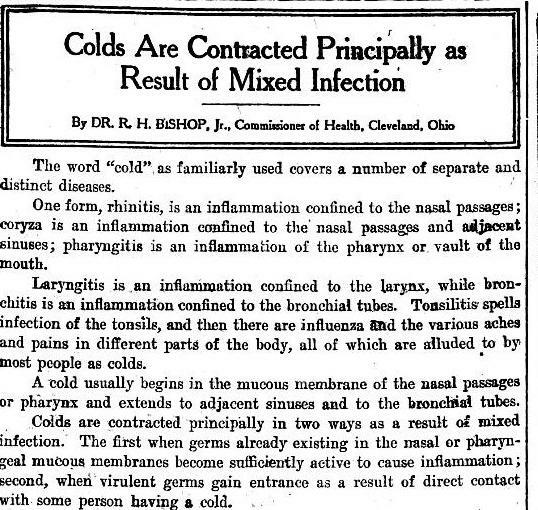 The Cleveland, Ohio Commissioner of Health's column on how colds are transmitted is reproduced in the local White Earth, Minnesota newspaper, The Tomahawk. The paper also shares that the Chippewa General Council will not be allowed to spend $10,000 of its own money to hire lawyers to investigate how the Indian Office is administering their land. The Carter Bill that will confer citizenship on all Indians is under consideration in the U.S. Senate. Source: "Colds Are Contracted Principally as Result of Mixed Infection," The Tomahawk, White Earth, Minnesota, February 21, 1918. Page 5, Column 1.